Have you ever felt so bombarded and overwhelmed by gadgets, devices, and computers that you felt like you wanted to just “unplug” from the world for a moment? Well, nowadays, if you want to do that, it may take more effort than it did in the past, thanks to the Internet of things (IoT). The term “Internet of Things” is used to collectively refer to the endless number of devices that are equipped to be connected to the Internet. These devices include anything and everything from the usual computers and smartphones to even the least expected things like automobiles, toys, and lamps. On the vast network of the Internet of Things, people can communicate with other people, people communicate with devices, and the devices can interact and connect with other devices. According to the research and advisory company Gartner, this IoT network is quite large and is expected to get even bigger. In 2016, approximately 6.4 billion connected things were in use, and Gartner forecasted that the number would increase to 8.4 billion in 2017, a 31% increase. Gartner also predicts that this figure will rise to 20.4 billion by the year 2020. IoT devices connect to the Internet through network sensors that are built into them, and these sensors collect and transmit data through Wi-Fi networks or Bluetooth connections, typically to an application that is accessed on a smartphone or to device manufacturers. On the surface, the Internet of Things seems like a great innovation that expands and streamlines communication, but does it also come with risks and challenges? Here are some pros and cons of IoT devices, along with ways you can keep these devices safe on the Internet. Convenience – Probably one of the most obvious benefits, IoT devices offer conveniences that make everyday tasks faster and easier to do. People who are away from home and forget to set their favorite shows to record on their televisions can set up the recording from anywhere through a TV app on their smartphones. If they live in smart homes, which are homes that are equipped with electronic appliances and heating and lighting devices that can be controlled remotely, they can also enjoy the luxury of raising or lowering the temperature in their homes from the sofa or bedroom using their smartphones, instead of having to physically walk to the AC thermostat. Another IoT device that many households use is a smart speaker, with Amazon’s Echo speaker being a widely popular one. With Echo in particular, for instance, users can speak to a voice-controlled intelligent personal assistant named Alexa to carry out a range of tasks including playing a specific song from a music channel on TV, turning the volume of the music up or down, getting the weather forecast, placing an order for food, ordering a product from a web site, and much more. Safety – Many of the conveniences that IoT devices offer also double as safety benefits that can prevent accidents and certain dangers from happening. Virtually all security alarm systems are connected to the Internet, so they can be activated from a distance on a computer or device if necessary. Panic buttons that are included with many alarm systems can be turned on from anywhere in the event of immediate danger, with police stations receiving notification of the panic alarm right away. Another safety benefit of IoT is that doors in smart homes can be locked from far away, and lights can be turned on with a few clicks on a phone at night to deter potential trespassers. IoT appliances like smart convection ovens that can be controlled wirelessly from a smartphone can also be turned on or off from anywhere, preventing accidents like fires in the event that users forget to manually turn them off. Internet-connected cameras inside and outside of a home can be used not only to watch out for intruders but also to monitor children to make sure they arrive home safely or don’t have any problems requiring immediate attention. Manufacturing – IoT devices and systems not only offer benefits to end-users or consumers that save them time and make their lives easier, but they also provide capabilities that the manufacturers of these devices and possibly also third parties can use to improve their business performance, especially in the long-run. As IoT devices like smart light bulbs contain sensors that connect them to the online world, they have the ability to transmit data such as power usage back to the manufacturers. The manufacturers use this data to assess the quality and function of the device and also to see if there are any current or impending problems with the devices. This can help them in product development and quality assurance to ensure that they make products that only improve and become safer over time. Privacy – Unfortunately, the benefits that the Internet of Things offers individuals and businesses also come with risks that leave IoT devices and users open to certain dangers, starting with privacy risks. The sensors and trackers in Internet-connected devices not only record and transmit data about the performance of the devices or information that consumers use for their own personal purposes, but they also capture secondary data like user preferences and interests, such as music genres and favorite foods. All of this primary and secondary information could be used unscrupulously by third parties, who may buy it from device manufacturers to target users with advertisements without the users’ knowledge. Moreover, many of these IoT devices are not secured, so they don’t have protective measures like data encryption, leaving this data open to hackers for theft. Hackers can then manipulate this data to commit identity theft or use it as leverage to launch online attacks. Software Flaws – In addition to privacy risks, IoT devices can also have technical issues like software flaws that can expose the devices and their users to online and offline dangers. Even if these devices send data to both users and manufacturers that indicate a systematic problem exists, some of these IoT devices cannot be patched, so those problems are never actually fixed and can create weaknesses that hackers can exploit. For example, if there’s a bug in a smart toy used by a child, then that bug can be exploited by a hacker to track the child’s physical location. Smart home appliances like coffee makers can also lay vulnerable to hackers who can infiltrate the Wi-Fi networks these devices are connected to in order to hijack them, which can pose physical hazards like electrical shortages. 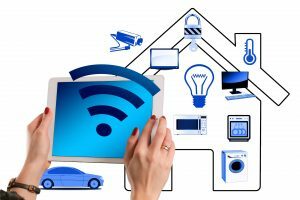 Only connect if necessary – Even if devices in your home are IoT-capable, like the refrigerator, you don’t have to connect them to the Internet if you don’t plan on using them online. Stay current with updates – Make sure that any devices for which the manufacturers provide firmware updates are kept current, as those firmware updates take care of issues like security bugs that hackers can exploit to launch attacks. Turn off UPnP – Universal plug and play (UNnP) is a feature that lets devices automatically recognize and find each other on networks to facilitate device connections without set up. It is convenient but also makes these devices more vulnerable to attacks. Keep this feature off on devices as a security precaution. Update default credentials – As soon as possible, replace any manufacturer-provided passwords on devices for connection to the Internet with complex passwords that use a mix letters, numbers, and symbols. If you want to keep your IoT devices and information safe from cyber threats on the Web, then it’s important to be aware of the kinds of online risks that exist, and you also want to have at least a basic understanding of how the Internet, its networks, and applications work. Cybrary is the perfect place to start if you want to start gaining cyber awareness and education on cybersecurity topics. Take a look through the Cybrary course catalog and start arming yourself against cyberattacks with knowledge today!